The Disney Rewards Visa Card currently has an Informr score of 5.6 out of 10. This score is based on our evaluation of 3 sources including reviews from users and the web's most trusted critics. 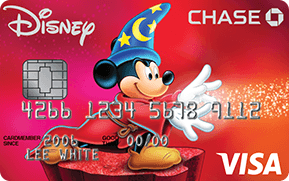 Disney Rewards Visa Card is typically available to those with good credit scores (650 or greater). This is an okay option if you love Disney. Yes, you receive special financing when you book cruises and vacations, earn Disney rewards points, and receive discounts at Disney theme parks and online stores. However, we believe that the Disney Premier Visa Card is a better option. 0% Promo APR for the first six billing cycles following the purchase date on select Disney vacation packages or purchase of a real estate interest, including a Member Add On, in a Disney Vacation Club Resort, provided your account is not past due on the purchase date. Earn $100 Disney Gift Card after first purchase with the credit card. Receive 10% off select merchandise purchases of $50 or more at select locations at Walt Disney World Resort and the Disneyland Resort. 15% off the non-discounted price of select guided tours at Disneyland and Walt Disney World Resorts. The Disney credit card is a fantastic spending aid for diehard Disney enthusiasts who really value Disney merchandise, vacations, and experiences. Since Disney reward dollars earned with this card can’t be redeemed for anything outside the Disney universe, the Disney Rewards Visa Card is not suitable for fair weather Disney fans, nor anyone else. If you go to Disney resorts every year and spend over $50 regularly at the Disney Store, then there’s plenty to appreciate. However, the rewards program, as it currently exists, limits how you spend your rewards and that might be a deal breaker. It’s a good companion card, but it shouldn’t be your only rewards card.